Only one week and one day left to enter My First Cupcake Giveaway! 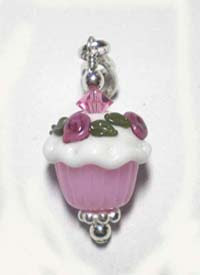 where you could be the grand prize winner of the delicious Rosebud Cupcake Pendant you see in 2nd photo. One week from Sunday 3 prize winners will be announced and it is SO easy to enter and there are up to 22 entries possible per person. I introduce to you today, The Bunny Queen Pendant. 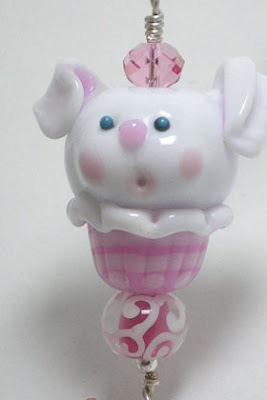 Awesome lampwork glass work here resulted in the softest, sweetest tones of milk white & pink. Look at the pink blush of the ears, lips & cheeks and the ruffles atop the matching basket...just beautiful. Available in my ETSY shop. Last month during our final rainy weather I visited my Godson's family in Napa. 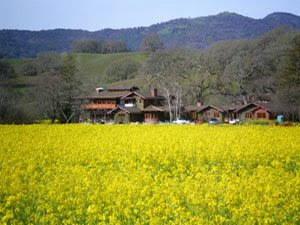 The very quiet Suisun (suss-soon) Valley was bursting with wild mustard. There were huge carpets of it covering hundreds of acres in several area. It was just amazing and the overcast weather seemed to intensify its vivid color. 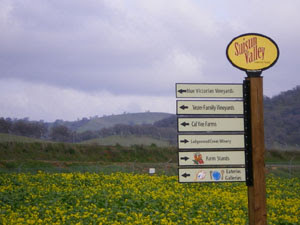 Here are a few shots of some of those amazing spots...the Suisun Valley guidepost....the construction of a huge house above a creek and a row of sturdy oaks. I kept pulling over and leaping out of my car with joy at these sights and was so glad that for ONCE I actually HAD my camera with me..haha. My jasmine is also bursting...out of its buds and I feel so good when I water and mist them each day. I keep waiting for their pungent aroma to fill the night air as that's when they release the most fragrance. It's a beautiful day today in the bay area so I think I'll just sit in the front patio and soak up some sun. 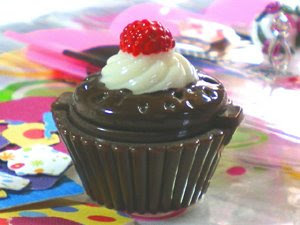 Be sure to click My First Cupcake Giveaway! 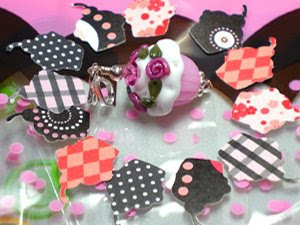 I'm trying something new today...an opportunity for you to get your cupcake jewelry right here on my blog! "I Heart Cupcakes" bracelet will be up for 3 days only, until Thursday at midnight (Pacific time) & ON SALE WITH FREE SHIPPING! First one to email me snags the purchase rights for only $95. This beauty will arrive gift wrapped in cupcake themed packaging (or heart if you prefer...just tell me in your email) and ships FREE worldwide via USPS first class rate. If mailed to U.S. addresses, this includes insurance & delivery confirmation....and keep checking back for new surprises. 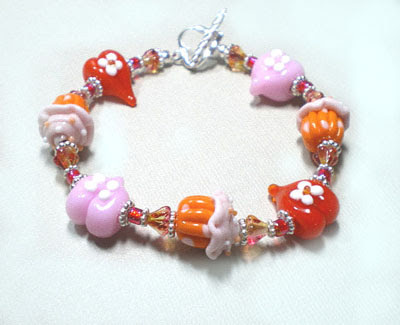 What is it about combining pink and orange that makes life so sweet? Payton Jett's hearts and Megan Ballarini's cupcakes mix beautifully here along with foil lined raspberry pink seed beads and yellow & pink washed bell flowers. Everything I just described is handcrafted lampwork glass so with the addition of the sterling silver spacers and heart clasp, you can enjoy loads of light flowing and sparkling in this piece. Every bit of this unique bracelet is handcrafted and you'll be sure to draw attention with this simple & elegant jewelry. I will cover the shipping costs for you so that you can enjoy the bracelet even more! Fits wrists that measure up to 7 1/4 inches (18.3cm). Cupcake and Heart beads 14mmx14mm. Be sure to refresh this page to see availability before you see "Going, going, gone!" What do you think of my new sweet bracelet? It's called Eggy Bunny and I just posted it at RockerJewlz. I love the soft pinks and periwinkles and that center rose colored chacon...wow! You've got to see the rest of the pics so you can experience the sweet pink blush of Bunny's cheeks and ears. Really nice work there. These colors just make life feel fresh so I thought I'd stay on that tack for the rest of this entry. My front yard jasmine is just packed with buds ready to burst into their white star shaped blossoms. It seems this year has produced more buds than ever before so it's clear the vines enjoy their home. No wonder the house finches are fighting over them! Their heady night time fragrance hasn't reached its potential yet and I look forward to it. I won a contest last month. See my prizes at FiberNeed blog. Sanna crocheted me these fabulous prize socks...pink, what more could a girl ask for, and in my bigfoot size as well...a perfect fit, I couldn't believe it . They provide just the right warmth too...not like some of my other socks that get too heated up. You can see my prizes here...the gingerbread pony shaped cookies were crisp and scrumptious. Thanks Sanna! 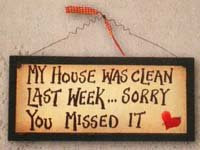 And lastly, as I perused the AllPosters.com catalog recently I had to crack into laughter when I saw this fabulous sign...what a great excuse that could work every time...as long as you use it on fresh victims. 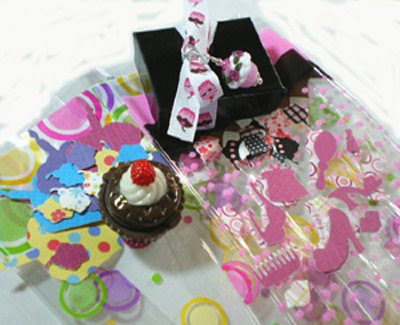 The big Cupcake Giveaway is still going so be sure you have all your entries in so you have a stab at some luscious cupcake earrings, cupcake gloss, and/or terrific hand punched cupcake stickers! I sure am enjoying reading your comments and establishing new friendships with those of you who care to. Okay everyone, the Cupcake Giveaway from the previous post is still going strong in it's first of 4 weeks! The next giveaway will be shorter I promise since I've now learned that the first couple of days are when most contestants sign up...lesson learned. Next one will be a week or less. "Y" did my cucumber have no seeds in its center??? 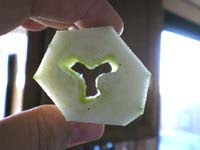 Look at that first picture: I peeled the cuke and sliced it and there was this "y" cutout inplace of seeds...how funny. I just had to take a photo it was so bizarre! grassy hillsides are incredibly green. Never before have my husband's allergies kicked up in January...wow. 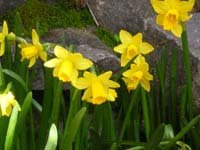 My daffodils were in full bloom in February...okay whatEVER. I'm just takin' it as it comes 'cuz I never KNOW when it's coming. 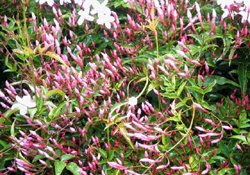 start scamming our front yard's jasmine vines for nesting possibilities. 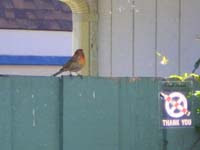 I started hearing him and the female last week along with the Mourning Doves that always visit in spring. 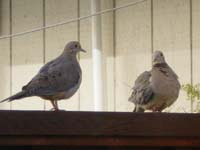 The doves love our side fence for its protection and yesterday they were preening there. They are so soft and pretty and I am mesmerized by their sweet eyes soft cooing. Something I've never experienced before are house finch nesting wars! There was great commotion going on yesterday and when I peeked out the window to hopefully snap some photos I saw 2 mating pairs fighting each other, I assume for nesting rights in the bushy jasmine. The females were slamming into each other and then the pairs would take off on a chase, but I could still hear them continuing their fight throughout the neighborhood before returning to our yard...and doing it all over again...quite violent but really funny. The star jasmine just began blooming this week. I so look forward to their deep and heady fragrance that is only released at night. 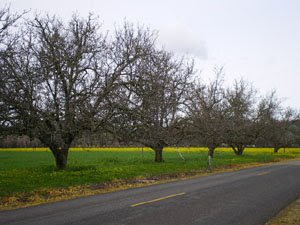 I'd love to hear the strange and early nature twists are YOU experiencing in your neighborhood. I'm putting together my first fabulous giveaway which will start at noon Pacific Time on Monday, March 9. Be sure to come back to enter for Cupcake themed fun. There will be several ways to be one of 3 winners!